Admin can do bulk operations delete/approve with the build in panel. what i observe that there seems to be a single design pattern on which this is implemented as i can see same type of features for post/pages or any other place in dashboard where items are being displayed in list. is there a way to achieve this.i will appreciate if some one help me to understand this. attaching a screen shot for better clarification. Not the answer you're looking for? 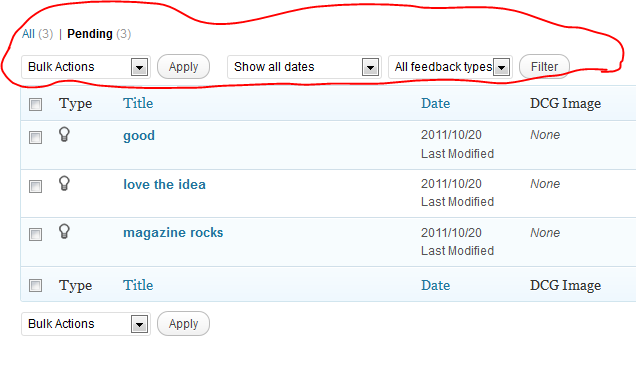 Browse other questions tagged plugin-development wp-admin admin or ask your own question. Can I set a default dashboard layout for all users? Help! Turn php link data into url OR hide edit link in post admin OR hide drafts for all users except admin? Copy my user account's wp-admin dashboard layout to other users?